Tulu is a Dravidian language spoken by roughly 1.95 million Indians in the southwestern region of Tulu Nadu, where the states of Karnataka (primarily Kannada-speaking) and Kerala (primarily Malayalam-speaking) meet. It bears a long history as a spoken language, and is considered one of the oldest Dravidian languages, but its written literature appears to be less-developed. Tulu was originally written in the Tulu script, a child of the Grantha script (and a sibling of today’s Malayalam script). The image above shows the Tulu independent vowels, consonants, and consonant/vowel combinations. The German missionaries who started the first printing presses in the area, in Mangalore, used Kannada type to print the Tulu language. Ever since, use of the Tulu script has declined. 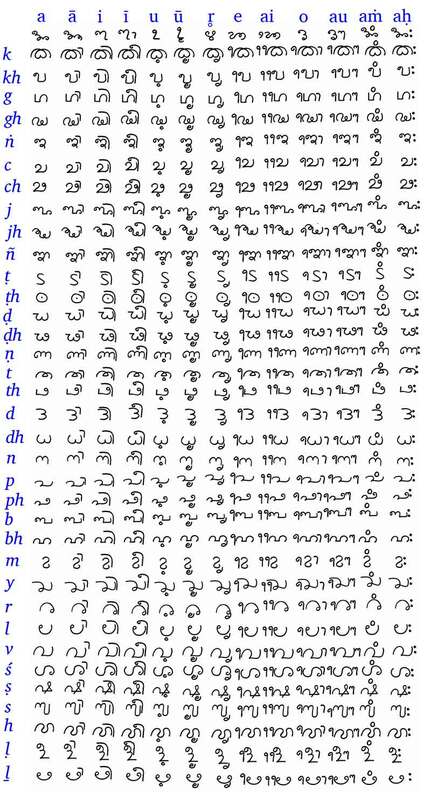 The Wikipedia Tulu script and Tulu language pages contain a great deal of information. More on Tulu can be found at Yakshagana and Tulu-Research. Image from Gyopi via wikimedia commons. I’m ashamed I havnet heard of it before, specially because I grew up in South India. Thanks for discovering it for me. I’m really interested in the source of this image. Where did you get this/ who wrote it?